This question kicked off our Community Studio Saturday program on September 9th. While considering this question, we introduced a book that has been very important to our research for SOIL SERIES, David Montgomery’s Dirt: The Erosion of Civilizations. What does it mean if civilization is eroding? David Montgomery is a geomorphologist, which means he studies the physical features of the earth’s surface and their relation to its geological structures. In Dirt: The Erosion of Civilizations, Montgomery argues that soil is our most essential natural resource and that it is necessary for modern civilization’s survival. If soil is so vital to civilization’s survival, how can we begin to value and take better care of our soil? The first step, we believe, is to listen. What can the soil on the EY Ranch tell us about its history, the history of Bethel, and how we can become better stewards of the land? Our Community Studio Saturday lessons on September 9th and 16th focused on this question. The above image is from the USDA’s Web Soil Survey, and shows at least four distinct soil types on the Empower Youth Ranch. These soil classifications already tell us a story about the ranch. Below are the descriptions of three of the most prominent soil series on the ranch. Cincinnati silt loam is present at the front of the property and where the fields meet the forest. The Cincinnati Series, established in 1912, is characterized by deep, well drained soils on till plains, which means they were formed by sediment deposited by a glacier thousands of years ago. Cincinnati soils are often used for growing crops like corn, wheat, soybeans, and tobacco, but a considerable percentage is used for pasture or woodland. Native vegetation on Cincinnati soils is deciduous mixed hardwoods, including oaks, hickory, tulip poplar, maple, and beech. Edenton loam makes up much of the soil in the forest on the ranch. The Edenton Series, established in Clermont County in 1928, consists of moderately deep, well drained soils formed in till (unsorted glacial sediment) and the remnants of clayey shale (a sedimentary rock composed of mud and mineral fragments) with thin strata of limestone (a sedimentary rock composed of skeletal fragments of marine organisms). Edenton soils are used for permanent pasture or woodland, but are not often farmed. Native vegetation is hardwood forest. 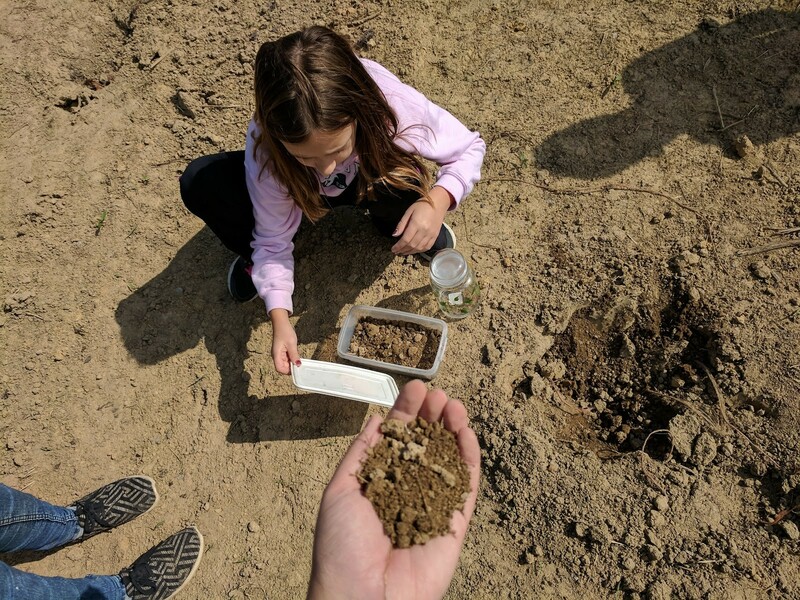 Our Community Studio artists had first hand experience with this kind of soil when we dug into the ranch’s creek beds looking for clay in week 4 of our Community Studio summer program. During our adventures in the creek we noted limestone in the creek bed and evidence of clayey shale on the slopes. We also noted the presence of fossils in many of the Clermont County creek beds, and even in the stone that makes up most of the area’s earliest structures (see our Meet Francesca post). This is because Ohio used to be under seawater during the Cambrian period 541–485.4 million years ago, and the marine life eventually became fossilized. In fact, the Cincinnati region lures paleontologists and fossil collectors from across the country (more info here). Westboro-Schaffer silt loams make up much of the fields on the EY Ranch. Soils in the Westboro Series, established in 1999 in Brown County, are very deep, poorly drained soils formed in loess (sediment formed by the accumulation of wind-blown dust) and the underlying till. These soils are also found on till plains, meaning they were deposited by a glacier thousands of years ago. Westboro soils are cultivated with crops such as corn, wheat, soybeans, grasses and legumes, and tobacco. The Schaffer Series, also established in 1999 in Brown County, consist of deep and somewhat poorly drained soils formed in loess and the underlying till on till plains. Most areas are being cropped to soybeans and corn, and a few areas are used for small grain, hay or pasture or are in woodland. Knowing the characteristics of the soil on this part of the property helps us understand why we’ve experienced so many drainage problems around the barnyard on the ranch. In order to receive proper readings on our tests, however, we had to sample the soil in a zig-zag pattern. One of our artists pointed out that these zig-zags looked like drawings! When we returned to the Barn Studio, we organized our samples to prepare them for the lab (results forthcoming). We also performed a simple experiment to better understand the mineral makeup of the soils we tested. A portion of each soil sample was placed in a jar, which was then filled with water. We shook up the jar until the soil and water had mixed together and then let it sit for over an hour. The results showed the humus (the organic component of soil) floating on top of a band of water. Beneath the water we could see layers of first clay, then mud, then sand, and then the small and large stones that had sunk to the bottom. Our project for the day involved making earth pigments with the soil we had collected and using them to color fabric. We talked about how an area’s soil doesn’t only affect its plant and animal life, but also the kinds of things that are produced by the people living on that land. In other words, soil can even affect a place’s culture. The fabric-making technology of the people of the Hopewell culture starts with the tending and collection of plants and animals that provide fibre, and continues through yarn and fabric formation. To develop a complete picture of this technology, it is necessary to consider the decoration of those fabrics. How were they coloured, and what materials were used to colour them? The time and effort involved in the production of textiles shows that their complex structure and the colour imparted on them played a significant role in the cultural expression of the Hopewell people. Decoration of a textile, particularly if it was intended to be buried or burned in a mound site where it would not be seen, reflects specific significance. Hopewell textile fragments from Seip Mound. Hopewell textile fragment from Seip Mound. In order to use our soil samples to make earth pigments, we had to first prepare the fabric. Whereas dyes molecularly bond with fiber, earth pigments have to be suspended in another medium that joins with the fiber. We decided to use soy milk to infuse the fabric with the proteins needed for the pigment to adhere. This method felt especially apt because of Clermont County’s history of soybean production. The next step was making the earth pigments. Our artists ground up the soil samples into dust and mixed them with eggs and soy milk for protein. Then they were able to freely paint with their newly-created pigments on the dry, soy-infused fabric. The last project in our Soil Stories series was a group effort to trace the map of Bethel using the earth pigments we had created from the soil on the ranch. Every aspect of the finished work is inscribed with the history of Bethel, from the makeup of the pigment to the soy milk we used to prepare the fabric.